Annie Sloan has been making her distinctive paint since its invention 1990. Annie is the doyenne of furniture painting; Chalk Paint™, a decorative paint by Annie Sloan is a unique paint available in 36 decorative and historical colours made specifically for painting furniture. One of the many great things about her Chalk Paint™ is that there is very little preparation required (if any), no priming so you can paint almost anything- bare wood, melamine, varnished and waxed surfaces. When it is protected with a wax finish it will dry into durable soft surface which will last for years. In September 2018, after 10 years, the Thomas & Lucia shop was closed so that we could concentrate on the services we offer using this amazing product i.e. furniture and kitchen painting. In addition, Sue (partner in Thomas & Lucia) is going back to her first love and is now offering a garden makeover service. Unfortunately, this means we can no longer sell Chalk Paint™ other than within the context of a commission. However, we recommended Chalk Paint™ stockist No64 Biscuit House in Milford-on-Sea for local and online sales or Dovetails Vintage who also offer an excellent online service. The finish you will achieve is perfect for breathing new life into tired furniture or up-cycling junk shop and vintage finds. With a few simple tools and some and wax you can achieve professional look to transform any room in your home and rejuvenate garden furniture for very little money. The paint is a versatile product can be used on furniture, floors and walls and requires little if any preparation on most surfaces. No previous experience is required. Simply follow the instructions on the tin or for more details you can download the Getting Started leaflet. 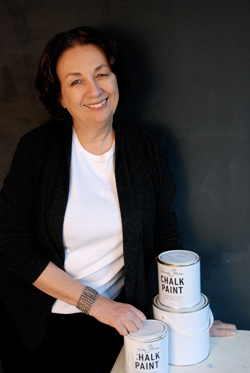 During our time as a Chalk Paint™ stockist Sue ran workshops and taught hundreds of people how to use the paint. Thomas & Lucia does not run workshops anymore but we are pleased to announce that Sue is currently running workshops with Glenn & Clare at No64 Biscuit House. You can see all the details, including information on how to book, on their website here. This is a very hands on class, you will learn and try colour layering, texturing the paint, a number of distressing techniques, crackling, decoupage, crackle glaze, gilding, colour washing & colour waxing. You will take home wooden boards as reference. Thomas & Lucia is owned and run by husband and wife partners, Matthew & Sue. We opened our shop and eCommerce website in 2008 (just in time for the recession!). We grew to one of the largest stockists of Annie Sloan products in the country and ran highly popular workshops. In September 2018 we closed the shop and opened a large workshop in Sway (not open to the public, sorry) were we now operate our furniture and kitchen painting services. Sue, who is a qualified horticulturist and garden designer, is also providing a garden makeover and consultation service.